Despite ash clouds dominating the skies, the 17th Concours Mondial de Bruxelles wine competition took place as planned at the end of April, in Palermo, Sicily. I had been invited to judge in this competition, and as Heathrow had opened the day before my flight was scheduled, my travel occurred largely uneventfully. The competition attracted entries from more than 50 countries. 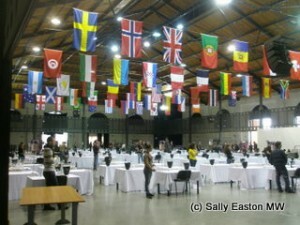 Nearly 7,000 wines and 350 spirits were entered, including a few wines from the UK. Forty different countries provided 275 judges, who sat down for three days to assess, in a traditional blind tasting, all the wines. Panels of 5 to 7 jurors judged around 50 wines each day. The complete list of winning wines can be found here.